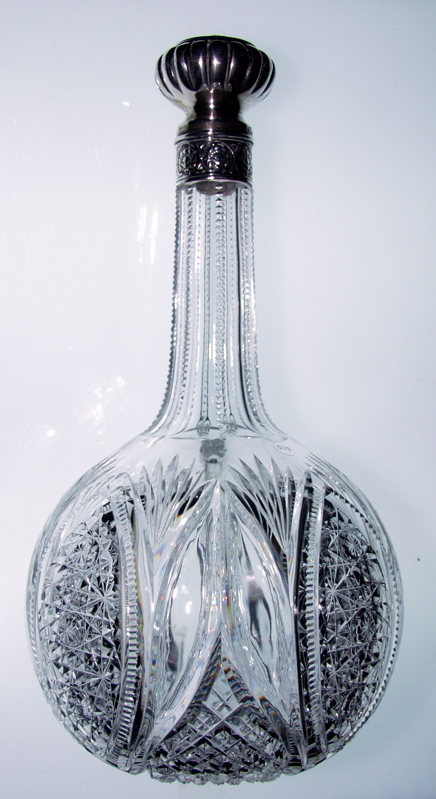 This decanter was made by J. Hoare in their 5417 design. 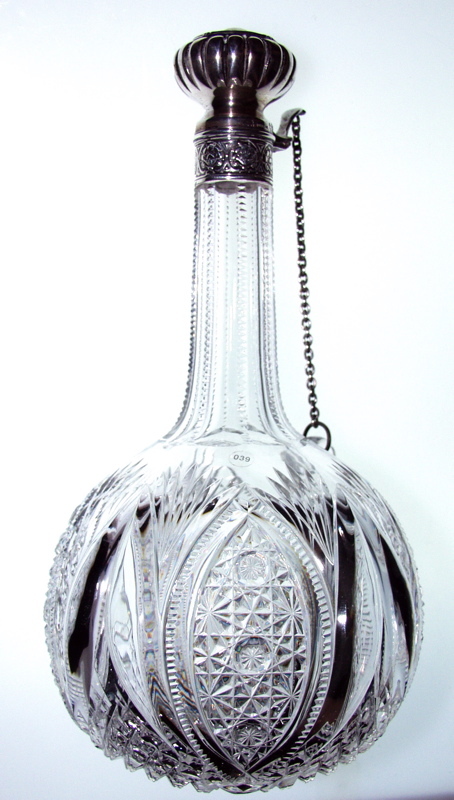 In addition to the wonderful cutting, the decanter has a silver flip top that has a chain running down to the body of the decanter which is held in place by a looped portion of glass. The silver was made by Whiting. 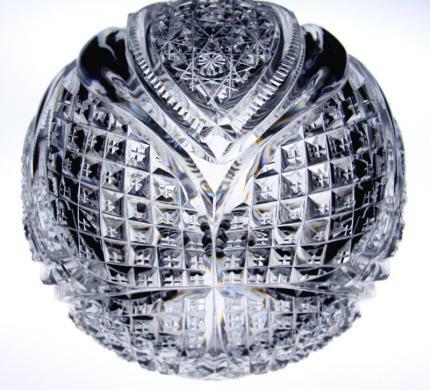 This decanter features some of J. Hoare’s best cutting. The first thing one notices when examining this piece is the huge clear tusk cutting. It is supposedly one of the most difficult motifs to cut and this piece features them so prominently. Two almost lean on each other and house a field of strawberry diamond cutting which runs its way across the base. The other portion of the pattern features meticulous Russian cutting encircled in notched cutting. The neck of the piece is fluted and notched. One thing particularly unique about this piece is the full pattern extension across the base – something seldom seen on anything, whatever the shape may be. 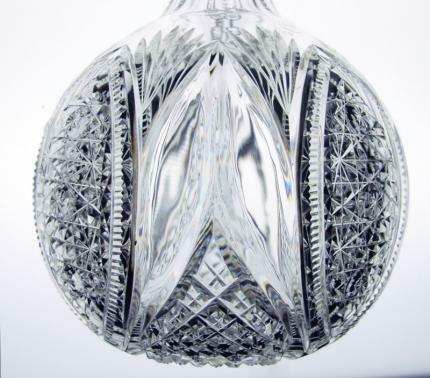 The decanter is in perfect condition with no issues or stains. The blank is exceptional and better than many of the earlier blanks. It measures 10 1/8″ tall and 5 1/2″ wide and is on the most beautiful blank. One of these decanters, with the chain, in Hawkes’ Chrysanthemum sold on eBay a few months ago in excess of $1000. 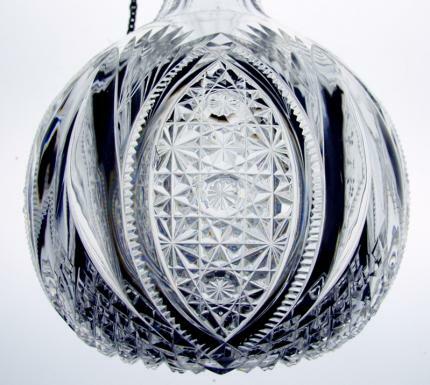 This one is priced less, yet features a rarer and more skilled design. This will surely be the highlight of a collection.